Of course, Captain Phasma has arguably the coolest suit of armor in the whole First Order. Certainly the coolest in the galaxy since a certain Mandalorian bounty hunter disappeared on Tatooine. With its fierce helmet, the shiny chrome exterior, and that sweet but sinister black cape, she's a very intimidating leader. She certainly could give Kylo Ren a run for his money! If you want to look as awesome and as fearsome as Captain Phasma, then you need the Adult Deluxe Captain Phasma Helmet. 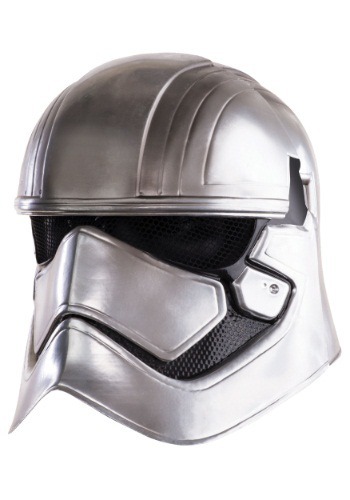 This officially licensed helmet recreates the look from Episode 7 and brings the dread-inducing Phasma to life. With a mesh-covered eye slit and interior foam pads, this helmet offers comfortability without sacrificing that spooky militaristic look that Phasma is so well-known for. Of course if you want to complete the look, then you’ll want to check out our full Deluxe Captain Phasma costume and the Stormtrooper Blaster accessory. Only then will you be ready to fight the most hardened of Rebel scum.